Nikon “Heartography” Made Grizzler a “Phodographer”. I want this for my dog. I want this for me. Nikon has developed a camera for your pooch that responds to the dogs heart rate and takes photos according to your dogs level of excitement. Nikon’s Heartography experiment is a 3D-printed custom case for a Nikon camera that can be strapped to your dog to take photos from a dog’s-eye view. The case is connected to a heart-rate monitor strap which is used to track the dogs heartbeat. When the dog’s heart rate spikes, the case tells the camera to snap a photo. While this is a Nikon experiment its a product I think would sell well. It’s a nice blend of technology, physical product and could have hooks into social media sites like Flickr, Instagram, Google +, and facebook. If you go to the Nikon Heartography site you can see a ton of examples that their canine pal snapped. They aren’t that bad, and large portion of them are as good as most of what I see on Facebook and Instagram these days. Posted in photography, Technology and tagged Digital Photography, Dog, Dog Camera, Heartography, Nikon, Phodographer, Social Network on May 19, 2015 by Author. Almost two years ago Google+ launched with great fanfare as a Facebook killer. It was going to be the hottest thing in social media. Two years and three redesigns later it is still struggling to find a place in the crowded social-media sphere. I like Google+ but I never use it. I use it less than Facebook, which is saying something because the only thing I post to Facebook comes from this blog via Twitter. I really want to love Google+, but the fact that there are no built in hooks to allow posts from other social networks kind of limits my use of it. I want a dedicated way to have what I post on Twitter, Facebook, Instagram, Hipstamatic, Flickr, Tumblr and every other network show up in Google+ seamlessly. Without a third party browser extension, and without me having to copy and paste what I posted elsewhere in my Google+ feed. Anyway, my micro rant is over. Below is a video showing the new layout for the redesigned Google+. Perhaps if Google is smart, they’ll listen to a growing number of people like myself, and open up the gate to their walled garden so it plays nice with the rest of the social world. Posted in Social Networking, Technology and tagged Facebook, Flickr, Google, Instagram, Social Network, Social Networking, Tumblr, Twitter on May 26, 2013 by Author. 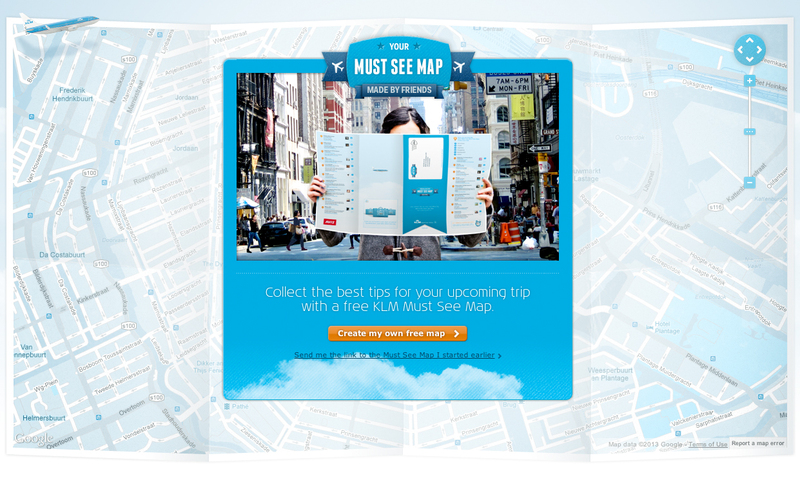 KLM Airline’s “Tile Your Self” Facebook Campaign. As Facebook becomes more and more of giant advertising engine, companies are scrambling to produce advertising that fits within the social media platform, and is actually engaging for the user. This is a tricky balancing act between creating something that seems real, and less like an ad, or creating something that feels like an ad, and gets very little traction and social engagement from your user base. KLM Airlines have tapped into something that represents Holland, and elevates Dutch national pride. Building off of Delft tiles, something that Holland is known for, KLM has created a Facebook application that allows fans of KLM to Delft themselves and create a Delftware tile of their Facebook profile picture. Facebook users can decorate their profile picture, add an inspirational saying and share with friends by using the KLM ‘Tile Yourself’ Facebook App.When you create and share your tile, you are automatically entered into a contest where the winners get to have their tile placed on a KLM jet, which will make numerous international flights promoting KLM and Facebook. All of this is well and good, but the payoff for participation seems pretty weak. Yes you get to make a cool looking Facebook profile pic and share it with your friends, but in the end what are your chances of actually seeing your image on the plane? I saw this and couldn’t help but think, why didn’t KLM offer the winners a custom one off Delftware tile with their image on it? Or the winners get a free trip on the plane that carries the tile images? There are so many more possibilities for this campaign that seem to have been missed. Posted in Advertising, Postaday 2011, Social Networking and tagged Advertising, Delft, Delft Tiles, Delftware, Facebook, FAcebook Advertising, Facebook Applications, Holland, KLM, postaday 2011, postaday2011, Social Advertising, Social Network, Social Networking on May 9, 2011 by Author. I am a non-Foursquare user. At one point I had it installed on my iPhone, but I got annoyed with the app, and my friends got annoyed with me checking in and it posting to things like Twitter and Facebook. I’m not anti Foursquare, I think it is a powerful application with a ton of possibilities for advertisers and marketers. A great example of this the Foursquare campaign for GranataPet in Germany. GranataPet makes a leading range of ultra-premium pet foods for the European and portions of the North American markets. GranataPet’s idea was to target dog owners as they take pet for a walk, positioning a Foursquare activated installation on key walking paths in the urban environment. Dog owners walking past specially designed billboards would be stopped by one of two factors. The editorial call out on the signage, or the scent of the food drawing their pets in. The billboards feature a specific call to action, asking the pet owner to “Check in. Snack Out”. When the pet owner “Checks in” on Foursquare at a “Snack Out” location, dog food is distributed to the bowl beneath the sign, giving your pet a sample. This action conditions not only the pet, but the pet owner as well. This conditioning, trains the dog to stop, and hopefully conditions the owner to believe their pet loves GranataPet dog food. This is a great example of leveraging a popular social media application, with a lower budget technology solution. This campaign builds buzz through check-ins, and has a viral spread with little or limited promotion. Posted in Advertising, Postaday 2011, Technology and tagged Advertising, Check In, Dog Food, Foursquare, GranataPet, postaday 2011, postaday2011, Social Advertising, Social Media, Social Network on March 29, 2011 by Author.